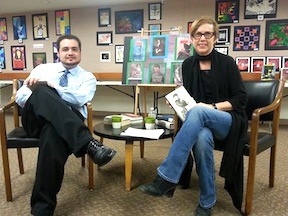 This past Monday, the Malverne Public Library hosted our tribute to Edith Wharton and I could not be happier! It was a wonderful evening of lively discussion covering several of Edith Wharton’s books: The Custom of the Country, Ethan Frome, and The House of Mirth. My co-host, John B. Tamburello, focused on the lovely and tragic Lily Bart while I ripped apart Custom’s Undine Spragg. We’ve been asked to return next March (again for Women’s History Month) and intend on focusing on various other works by Wharton. I’m feeling blessed all around having such a wellspring of creative work to dig into and share with other readers of classic literature. ← Becky Sharp – Heroine? What great news that you’ve been invited to return next March! Which of her works do you think you’ll focus on? This evening, my father and I were discussing “False Dawn” and “The Spark,” from Old New York, with their references to John Ruskin and Walt Whitman. And I love the other two novellas in that collection. How was your discussion of “Roman Fever”? How many of your audience members had read the works you were discussing? Or did you find you were introducing people to something new and exciting? Thank you Sarah! Yes, I’m so happy that it was a success! Since we hardly touched on The Age of Innocence, I’d like to focus on that for next year — along with The Reef. A few members of the audience had read Roman Fever, but as the discussion had already gone over an hour, we wrapped it up fairly quickly. We had a nice mixture of readers (Wharton fans and newbies). Many had read The Age of Innocence, The House of Mirth, and Ethan Frome, but were completely unaware of The Custom of the Country. I’m certain that Undine Spragg will be making the rounds this month! Undine always likes to make new friends, though I expect she’ll keep them only if they turn out to be useful to her. The Reef is a great choice, as is The Age of Innocence, of course. Should be fun to prepare for next year.